Translation of an article : (c) Ouest France, 08/02/2011. Arnaud et Dominique Pérée - Aurons-nous le droit de mettre nos filets ? Pérée brothers : Will we be allowed to put our nets within the windfarm ? 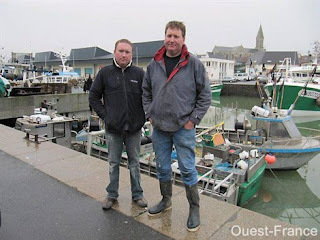 3 fishermen, fishing off Courseulles and Port en Bessin (Normandy) express their view about the next "Courseulles windfarm project". Their fishing gear : small-scale fishery, nets and traps fishing, and small bottom trawler. 3 pêcheurs en activité au large de Courseulles et Port en Bessin (Basse Normandie), expriment leur point de vue sur le futur projet éolien prévu au large de Courseulles. Ce sont des petits fileyeurs artisans et un petit chalutier de fond. Fishermen fear the new windfarm project - Right to fish within the farm - rise of cost by 50% - loss of catches ? Les pêcheurs redoutent le nouveau projet éolien - droit à travailler dans le périmètre de la ferme - augmentation des coûts de 50 % et pertes de captures ? "We fish with both nets and traps. During the scallop fishing season in the bay of Seine (december to the end of february), we don't fish. We do not fish far from the coast. We don't feel being understood by decision-makers. We do not support these new windmills. Sébastien Rabasse share this point of view, even if he is specialised in bottom trawling all year long. "It infringes on my freedom of work. This project does not take into account the bad impacts on fisheries"
Many questions are raised: "Will we be allowed to fish with nets inside the windfarm ?" wondered Pérée Brothers. If not, that will decrease our fishing grounds and will create more conflicts at sea [between active (trawlers) and passive fishing gears (netters)]. The worries from scallops dregders and whelkfishers are rights"
Sébastien Rabasse feels very concern as he already fishes on this area. "we will have to go further off, because we do not want to work on smaller vessels fishing grounds. By chance, my fishing boat is bigger (16 m). I will manage, but it will increase my fuel costs and decrease my profitability". For the fishermen, this project will have financial impacts. "we will use the same fishing gear, but we will stay longer at sea. say Pérée brothers. We face quotas. With the aggregate dregdging in Le Havre habour, fish, and especially sole, is getting scarcer. We will earn less. Sébastien Rabasse is also worried about its profitability in short term. With the same catches and increase of distance, I will decrease my earnings by 50%. Le projet d'implantation d'éoliennes en mer au large du Bessin alimente les conversations depuis l'annonce du secteur retenu, celui de Courseulles. Arnaud et Dominique Pérée, ainsi que Sébastien Rabasse, marins pêcheurs, expliquent leurs craintes. Can we fish inside it | Peut-on y pêcher ?